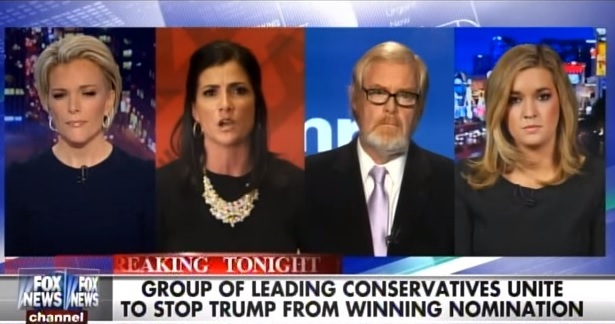 Conservatives are SICK AND TIRED of FOX News Channel’s constant bashing of Donald Trump. You’d expect this from the liberal media but FOX News today is the most anti-Trump channel on cable news. The viewers aren’t stupid. They’ve noticed. In February Brand Index reported that trust in FOX News network had dropped nearly 50% since January. It’s one thing to endorse a candidate – It’s quite another to give 90% of your air time to Trump bashers. This goes on ALL DAY LONG. Viewers are sick of it. From the time you turn on the TV in the morning – to their last show at night you are inundated with Trump haters, Trump bashers and anti-Trump segments. If it’s not the host, it’s the majority of the guests. Sean Hannity and Greta Van Susteren are fair. Bill O’Reilly gives double segments to Trump basher Krauthammer and then wonders why the Trump campaign cancels an interview the next night. Hello? Once in awhile, FOX News will mix things up and invite a Conservative Trump-basher to debate a liberal Trump-basher. Now, that is a real crowd pleaser! Or, they’ll invite Charles Krauthammer to come on and bash Trump and follow that up with a special Megyn Kelly segment of Michelle Fields’ hoax attack with sidekick Ben Shapiro. But FOX News is still spreading the lie that Michelle Fields was assaulted. It’s a lie but it hurts Trump. So they’ll keep airing it. Trump supporters are forced to turn the channel or mute the sound. If there was another channel out there that gave Donald Trump a fair shake they would steal half of FOX’s audience. The Blaze is one option but Glenn Beck is too busy preaching, praying and holding revivals with the Anointed One. If NewsMax went Pro-Trump they would steal half of the FOX audience in one month. There’s a market out there for disgruntled FOX-News-watching Trump supporters. Somebody smart should get on it and save the Trump supporters from the dreadful FOX News network.